​Welcome, November! 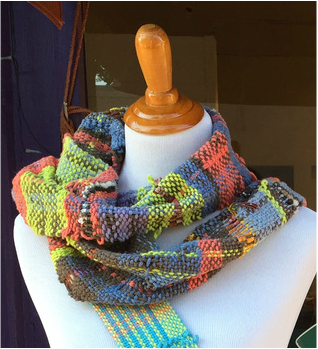 And welcome to the November edition of the monthly newsletter of The Makery, the freestyle weaving studio, gallery, and school of craft in Silver City, New Mexico. You are receiving this email because you’ve signed up through our website. We aim to bring you news of our creative workshops, special events, drop-in weaving sessions, and general studio goings-on. Here at The Makery, we are starting to think about that Most Wonderful Time of the Year! Here’s what we have going on this month. We call it “drop-in weaving” because there is no pre-registration required—just show up and weave for two-hour blocks of time. Your Introductory Session will be $15, plus the cost of materials by weight ($2 an ounce), after your piece is finished and cut off the loom. In one two-hour block, you could weave a one-of-a-kind piece of art to hang on a wall, or maybe cloth for a bag to give as a gift. In two two-hour blocks, it is possible to weave a scarf (depending on the individual weaver, of course!). The average cost for materials for a scarf is about $10-12. Each session after your Introductory Session is $20, plus the cost of materials. For kids participating in Drop-In Weaving, we give a $5 discount off registration fees. Join us for Drop-In Weaving. Let us be your creative outlet! Want to make your own gifts this holiday season? Learn how in our Creative Workshops! Come and learn how to make handbound journals and photo albums, beautiful lace bookmarks, custom photo mats, and funky hats. See our Upcoming Creative Workshops below or click here for more information. Don’t want to make your own gifts? Be sure to stop by The Makery to shop our great selection of one-of-a-kind, handcrafted gifts for your loved ones this holiday season. We have handbound books, handwoven scarves, cowls, and capelets, hats, purses, and Christmas ornaments. You’ll find lots of other unique items at The Makery, including Christmas ornaments and smaller items such as handwoven barrettes and keychains, paper pulp beaded bracelets, tiny books, and lace bookmarks. (Stocking stuffers, anyone?) All of these one-of-a-kind items are handcrafted here in our studio. We’ll also be putting together some drop spindle spinning packages—maybe you’d like to give the gift of a new hobby this holiday season? In addition, we can create items to your specifications—just come in and ask! Are you looking for a truly unique group gift this holiday season? Why not turn it into a group party, as well! 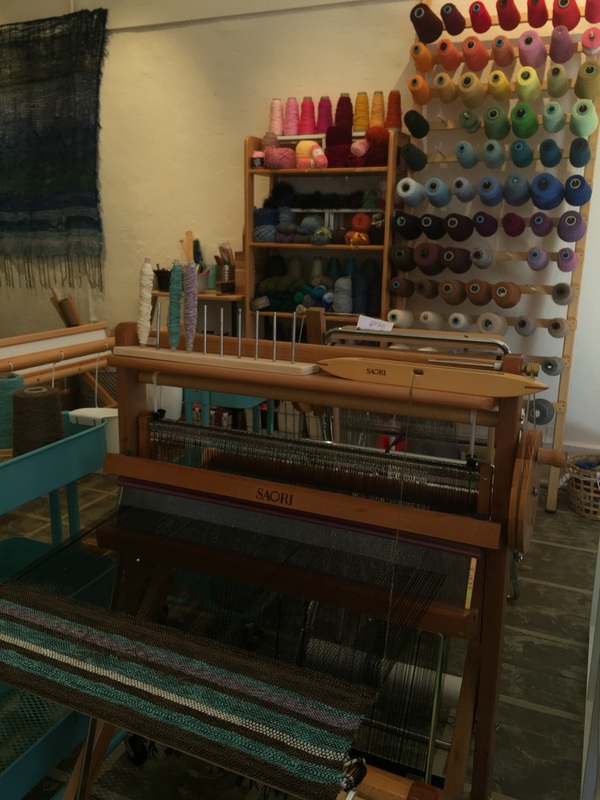 Bring your group into The Makery and have everyone contribute to a group weaving, such as a scarf or wall hanging. Depending on the size of your group and your desired gift, we can arrange a 2- to 4-hour session where each person in the group will get some time to sit down at the loom and weave their heart and soul into the group gift. The rest of the group, in the meantime, can partake of any food and drink your group brings, socialize, and have fun. In the end, you will have one truly one-of-a-kind gift to give to that special person—something no one else could possibly give them, because a little piece of each of you will be woven into that unique cloth! Contact us for pricing and to make all the arrangements. There are several creative workshops coming up at The Makery. When you see one that interests you, be sure to sign up soon, as some of these workshops are filling up! Make a special handbound journal, sketchbook, or photo album at our Bookbinding: Coptic Stitch workshop on Saturday, November 12, from 1 pm to 5 pm. This distinctive binding stitch creates a book with an attractive spine, and one that lays completely flat. For one of the books, we will use upcycled materials for the cover (I’m thinking old record albums and game boards…). All equipment and materials will be supplied for your use in the workshop, and you will actually go home with two of your own handbound books. (One to keep and one to give away, maybe?) The cost for this four-hour workshop is $40 registration fee and $10 materials fee. 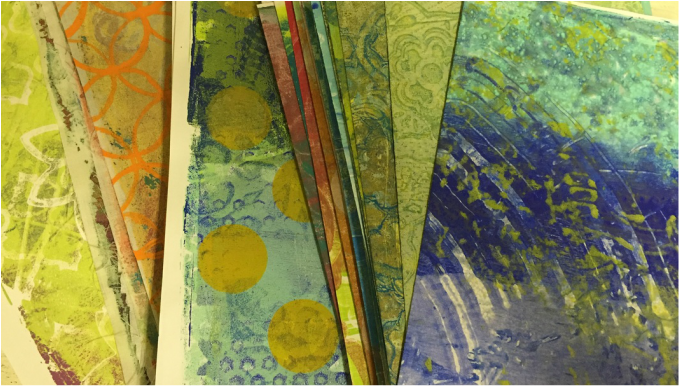 Our other remaining creative workshop in November is Monoprinting on Gelli Plates, on Saturday, November 19, from 10 am to Noon. (See photo above.) This will be a relaxing opportunity to just play with paper and paint. Gelli plates are a fun tool with very little learning curve, so we will be creating lovely little pieces of art quickly. You can print on paper, cardstock, or fabric, and use the final result in many different ways, including for cards, book covers, photo mats, and in mixed media projects. You will go home with lots of monoprints to admire and use! The cost for this workshop is $20 registration fee and $5 materials fee. On Thursday, December 1, we will offer another bookbinding workshop--Bookbinding: Long Stitch. This one will be an evening class, from 6 pm to 8:30 pm. The long stitch binding also creates a neat book that lays completely flat, and will also fold back on itself easily, making it an excellent option for a sketchbook or journal. We will make a soft-cover book, so you might choose to make a cover that flaps over the exposed edge of the text block, which is a nice option for a book you might choose to throw in a backpack, purse, or travel bag. The cost for this workshop is $25 registration fee and $10 materials fee. We have several more workshops scheduled for December. Visit our Workshop page for more information. Shop Small on Small Business Saturday, Then Stay for the Lighted Christmas Parade! After your holiday shopping, be sure to stay downtown for a nice bite to eat, then watch the Lighted Christmas Parade as it travels down Broadway and Bullard. Why not bring the family down and make a day of it! 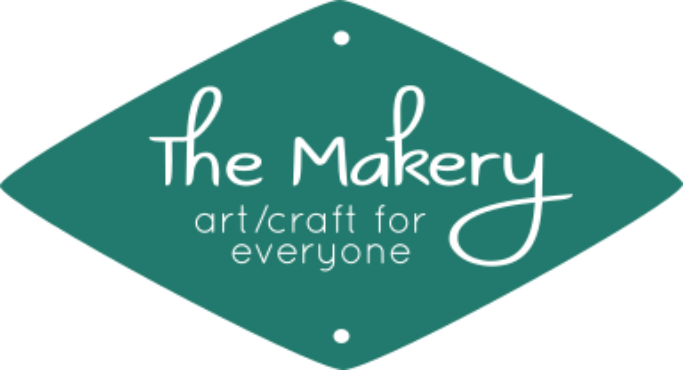 I will write more about this in the December newsletter, but we at The Makery are planning some special things for Saturday afternoons between Thanksgiving and Christmas—free Make & Take sessions for all ages! Each Saturday, we’ll offer a different small item for you to come in and make, then take home with you. The first Make & Take session will be on November 26, and it looks like it’s shaping up to be hand-wrapped pencils. Stop by and make one for yourself! The Makery will be closed on Saturday, November 5, due to a family event, but we will re-open for our regular hours on Sunday, November 6. We apologize for any inconvenience this may cause. We will also be closed on Thanksgiving (November 24), and our regular Drop-In Weaving session will be cancelled that day. Other things to watch out for in December are the Silver & Red Holiday at the Galleries event on December 3, our special Kids’ Classes for the Holidays series on the first three Saturday mornings in December, and look for our new Spring 2017 schedule coming out sometime in December! Keep your eye out here on our website for more information. ​Wow, so much is happening over the next two months! Be sure to stop by and take part, or just to wish us a Happy Holidays! We hope you have a wonderful Thanksgiving with loved ones and friends. See you soon!